Since September 2015, Oliver Kroemer has joined the Robotic Embedded Systems Lab ( "RESL") of Prof. Gaurav Sukhatme at the University of Southern California (USC) as a postdoctoral researcher. Oliver joined the Technische Universitaet Darmstadt (translates roughly as Darmstadt University of Technology) in 2011. Before coming to TU Darmstadt, he had been with the Max Planck Institute for Biological Cybernetics since 2008, originally as an intern and subsequently a Ph.D. student with a scholarship. Oliver defended his Ph.D. thesis on Machine Learning for Robot Grasping and Manipulation in 2014. 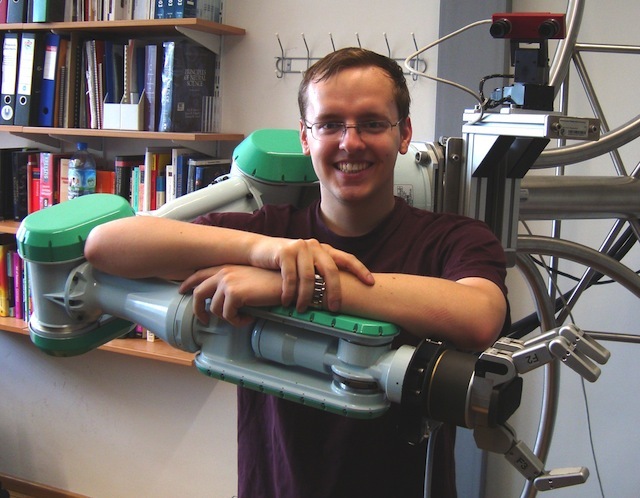 He was a finalist for the 2015 Georges Giralt Ph.D. Award for the best robotics Ph.D. thesis in Europe. Oliver did a Master's and Bachelor's degree in engineering at Cambridge University. While at Cambridge, he was a member and senior scholar of Trinity college. His studies focused on Instrumentation and Control Engineering, which combines elements of information, electrical, and mechanical engineering disciplines. The selection of courses was specifically chosen for a future career in learning robots. In his last year at Cambridge, Oliver wrote his Master's thesis under the supervision of Prof. Daniel Wolpert, and received multiple awards for his work. Oliver specializes in robots learning to grasp and manipulate objects. This area of research has existed a long time in the robotics community as it is one of the most fundamental abilities for any humanoid. Do to its interdisciplinary nature, reliance on advanced endeffectors, and the inherent complexity of the task, robot grasping remains a challenge. It is also these qualities that drew Oliver to the topic. Although having been born in Germany, Oliver has spent the majority of his life abroad. The longest amount of time spent in a country was eight years in England, but he has also lived in Norway and the United States, all of which he has fond memories of. This multicultural upbringing has also made Oliver bilingual, which is perfectly suited to the Robot Learning Lab environment. Oliver co-organized the ICRA 2014 workshop "Autonomous Grasping and Manipulation: An Open Challenge", and he co-organized the workshop "Beyond Robot Grasping: Modern Approaches for Dynamic Manipulation" at IROS 2012.